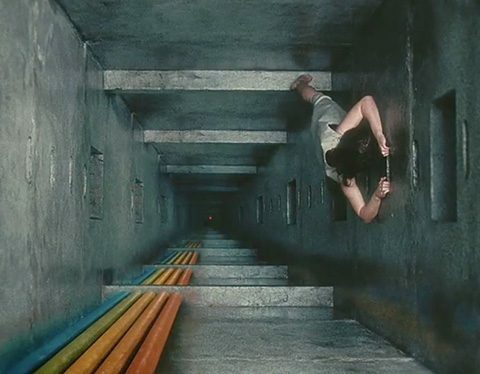 Beyond The Black Rainbow, Panos Cosmatos, 2010 (110 min.). Cosmatos declared that his “modernist” use of color was influenced by Michael Mann’s Manhunter (1986) and The Keep (1983). The blue hue cinematography – the “night mode” as Cosmatos dubbed it – was inspired by the freezer room scene in John Carpenter’s Dark Star (1974). Norm Li cited other references: Daft Punk’s Electroma (2006), Dario Argento’s Suspiria (1977), and George Lucas’ THX 1138 (1971). A number of reviewers noted similarities between the film and Stanley Kubrick’s 2001: A Space Odyssey (1968) and A Clockwork Orange (1971). “I love Stanley Kubrick, and have seen, and probably internalized, all of his work, but any similarity was not my intent“, explained Cosmatos. Critics have also compared Beyond the Black Rainbow to Andrei Tarkovsky’s Solaris (1972), Ken Russell’s Altered States (1980) and Gaspar Noé’s Enter the Void (2010). Barry Nyle descends into the black liquid as he starts his 1966 psychic journey. The 1966 flashback segment of the movie was inspired by E. Elias Merhige’s experimental horror film Begotten (1990). Begotten was entirely shot in high-contrast black-and-white, which for Cosmatos “was a perfect look for the flashback because I wanted it to feel like a fading and decayed artifact.” The young Barry Nyle’s acid trip in that segment of Beyond the Black Rainbow was inspired by the “Battle of the Gods” sequence in Jean-Luc Godard’s Contempt (1963). Cosmatos also takes influence from other visual media. The director declared his love for Heavy Metal magazine and the work of French comics artist Jean “Moebius” Giraud. Fantasy art was also an influence, especially Frank Frazetta’s paintings. Norm Li stated that both he and the director “also looked at abstract paintings, photographs, and architectural design books” for inspiration. I decided to just write as straightforward as possible, then let the visuals and the look of the film bloom around something that was pretty straightforward. At the end of the day, I decided to bring down the story elements to allow the visual and the story elements to come more into the foreground, to make it more dream-like and less story-driven. Jeremy Schmidt, keyboard player for Vancouver-based rockers Black Mountain, was invited by Cosmatos to compose the film’s soundtrack. “Evil Ball”, a track from Schmidt’s solo project, Sinoia Caves, was used by the movie’s director on a private screening held for Schmidt. A mutual appreciation for Tangerine Dream, John Carpenter soundtracks and Giorgio Moroder’s music for Midnight Express (1978) and American Gigolo (1980) cemented their bond. Schmidt also pointed out the background music from The Shining (1980) and Risky Business (1983) as musical blueprints for the Beyond the Black Rainbow score. Regarding the impact of The Shining’s soundtrack on his score, Schmidt singled out the compositions by György Ligeti and Krzysztof Penderecki as sonic touchstones. Their music had already been featured the sci-fi and horror genres, two of Cosmatos main cinematic obsessions when young. Ligeti pieces “Lux Aeterna” and “Atmosphères” had been featured in 2001: A Space Odyssey, and Penderecki’s “Polymorphia” and a portion of “The Devils of Loudun” was used in The Exorcist (1973). For his analogue synthesizer score, Schmidt used the following equipment: a Prophet 5, two Oberheims, Moog Taurus bass pedals, a Korg CX-3 organ and a Mellotron. An extensive use of the Mellotron can be heard on the flashback sequence, where Cosmatos had been using Pink Floyd’s “Set the Controls for the Heart of the Sun” as a temp track. All in all, “the chosen palette of sounds definitely harkens back to ‘The New Age of Enlightenment'”, said Schmidt. The music was mixed by Joshua Stevenson at Otic Sound, Vancouver, British Columbia, Canada. Shot on Panavision GII and Panastar 2-perf 35mm and Panavision Ultra Speeds and Primos. Fuji Eterna 400T.